Another Facebook infographic! Seriously? Yes, because it’s about the Facebook Profile Picture and that’s “the photo we all care about“. 10% of all Facebook photos are profile photos. That’s billions of profile pictures. Women upload more profile pics; A new one every 2 weeks, while men typically upload a new one every 3 weeks. We change our profile pictures more often every year. Numbers have tripled since 2006. 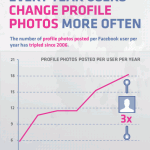 The average user has a total of 26 profile photos. A typical profile picture has 3 likes and 2 comments. How does your current one score? There’s one user out there with 157 comments on it. Brought to you by Pixable. Posted by Pieter on May 27, 2011 at 9:07 PM. Use this trackback if you're linking this story.